ISHRAD is the first Society especially dedicated to the History of Radiology and Radiological Technology. The aims of the society are the advancement of scientific research and exchange of information in the field of the history of radiology and radiological technology and practice. These aims will be furthered in the first instance by the collection and presentation of specialist scientific contributions on a new website, through the organisation of exhibitions, scientific congresses and meetings on the history of radiology and radiological technology and practice. 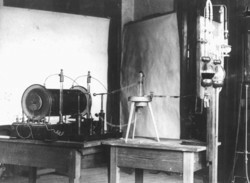 The story began in 1895, when a German physicist discovered a new kind of rays. The development of diagnostic imaging has been the result of a fruitful relationship between doctors, radiographers, physicists and equipment manufacturers. New apparatus has stimulated the introduction of new techniques and medical needs have in their turn stimulated new developments in equipment. Many new techniques have been introduced in recent years. The principles of CT scanning were first described by Godfrey Hounsfield and the first prototype EMI scanner was installed in 1972 at Atkinson Morley’s Hospital. Work was progressing on Magnetic Resonance Imaging (MRI) in the 1970s and the first human image was obtained at Aberdeen in 1977. Nuclear Magnetic Resonance can be used to either to produce planar images of anatomy or as Magnetic Resonance Spectroscopy can provide biochemical information. Ultrasound started in the 1950s and gained popularity in the 1960s. “Real-time” ultrasound machines were introduced in the late1970s and ultrasound is now the most commonly used examination after plain radiographs. The use in the last 10 years of Doppler technology has enabled flow to be assessed as well as anatomy. These new techniques have displaced many of the older X-ray techniques and this process will continue. In modern radiological practice it is not possible to consider techniques in isolation. An integrated approach is needed with the various techniques used as appropriate. Often it is better for a complex procedure to be used early in an investigation since a diagnosis may be reached quickly with minimal inconvenience and risk to the patient. In recent years the widespread use of percutaneous biopsy techniques and ultrasound and CT scanning have considerably reduced the need for exploratory surgery. There have been many changes in medicine which influence radiological practice and for example, the increasing use of endoscopy has considerably reduced the need for barium meals. The recent developments in diagnostic imaging have considerably facilitated the recent trend to investigate and treat patients as day cases or as outpatients with considerably less disruption to the patients life. Until the 1980s the techniques needed to store reports and films had changed little since the 1920s. Modern technology is transforming departments with the introduction of computer management systems and digital image storage. This last technique will dramatically alter the use of images with studies being transferred via links between different institutions and offices. The last 100 years have produced many changes and the next 100 will be even more dramatic. To stimulate the study and conservation of radiological history, the International Society of History of Radiology was founded in 2011.